Meg Birnbaum who exhibited at Davis Orton Gallery in September, 2009 is the featured photographer at Tanto Tempo Gallery and Cafe in Kobe, Japan, February 6 – March 21, 2010. She is showing work from two series: “Corn Dogs, Blue Ribbons …” and “Daylight Savings.” Meg creates her evocative black and white images using plastic toy cameras (Holgas and Dianas.) She will be giving an artist talk at the gallery on March 13. Meg’s work has also been selected for exhibition in juried shows in SoHo and San Francisco. In SoHo, her photograph “Cheek to Cheek” will appear in Soho Photo Gallery’s 12th international Krappy Kamera competition, March 2 – April 3. In San Francisco a photograph will be featured in RayKo Photo Center‘s Third Annual Juried Plastic Camera Show. 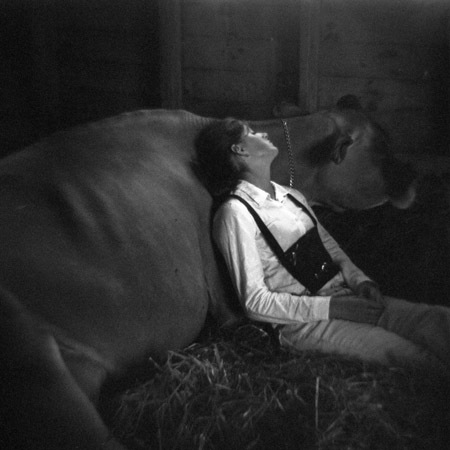 This entry was posted in News and tagged black and white, blue ribbons, cheek to cheek, cow girl, Davis Orton Gallery, holga, Meg Birnbaum, rayco photo center, Robert Frank, soho photo gallery, tanto tempo gallery, toy cameras on February 17, 2010 by karendavis.